and Buddhism-at the holiest city of Puri, with its marvelous temples dating from 3rd century, situated at the exotic sea resort in the Bay of Bengal. 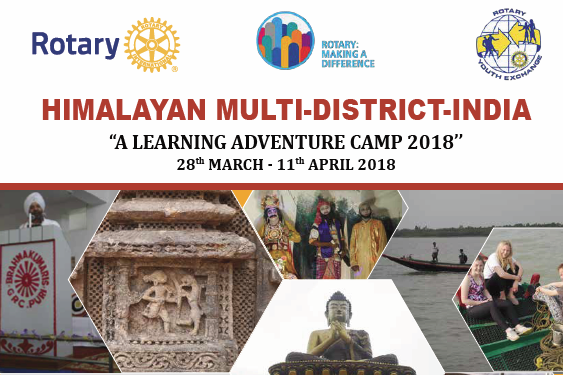 From there on to the picturesque Himalayan State of Sikkim, in the city of Peling and Gangtok, visiting the oldest monasteries, interacting with the Lamas. we were so fortunate to sight one in 2011. It has left an unforgettable deep impact! Maximum participation will be 30 and on first come basis. Age 16-25 years. Registration Rupees 82,000 (current rate is 1 Euro = `72/-) INCLUDES: Traveling on trains (airconditioned with sleeper berth), local transport. Site-seeing. Meals: Breakfast, lunch and dinner. Accommodation-3 to a room with attached bath all in reasonably good hotels and resorts DOES NOT INCLUDE: Cold drinks, mineral water, laundry, telephone, ENTRY FEE TO SOME MONUMENTS, WHITE RIVER RAFTING and anything extra which is not included in the above. All train and hotel reservations have to be done three months in advance. PDG Surinder Singh Sahni, Bombay Motor Co. Chas 827013, Bokaro-Jharkhand, India.